This swivel female hose thread fitting is available with either a 3/4" male hose thread or 3/4" male pipe thread on the opposite end. 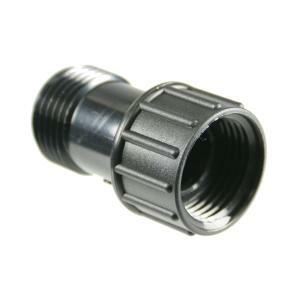 These 3/4" (FHT) swivel adapters come in handy when you need to connect anything to a faucet or hose end and the "thing" you are connecting does not have a swivel fitting. That's when this doohickey comes to the rescue. Just install this adapter and you'll never have to twist your "thingy" round and round to remove it from the faucet.